Flipside by Jenny Twist is a fun, contemporary romance about two star-crossed British lovers, but with a distinctly characteristic twist that is part science fiction, part fantasy, and part mystery-thriller, all rolled into one story that will keep you guessing until the very end. 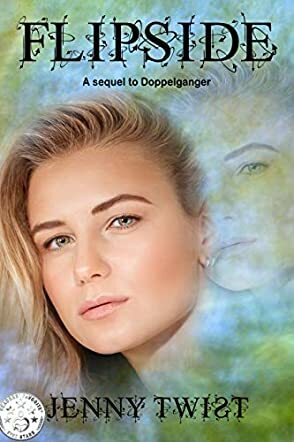 The book was written as a sequel to Jenny Twist’s other science fiction story, Doppelganger, but with a quickly engaging plot and easily relatable characters, it is sure to be a hit with fans and newcomers alike. Flipside is the kind of book you can read just about anywhere; you can be sitting quietly at home or waiting for food in a restaurant but as soon as you start reading you won’t want to stop. Ms. Twist has a captivating style of writing capable of pulling you into another world from the very first page, and capable of re-immersing you right back where you left off should you need to take a break. The book is simple to read and easy to follow, but is filled with enough suspense, surprises, and candid humor to keep the pages turning. For being such a simple love story, the book is absolutely brimming with characters and intrigue, all thanks to Ms. Twist’s excellent style and execution. This book is something wholly original, and entirely unique. Highly engaging, the story hooks early and doesn’t let up. The book is short, but it has such a fast-paced plot that it makes for a quick, highly enjoyable read which will leave you wanting more!